Not All Who Wander are Lost: I got accepted!!!!! Congratulations! 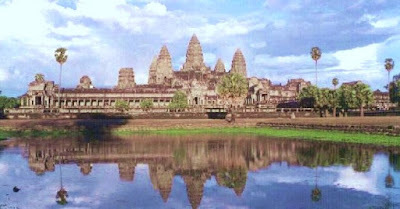 You have been Accepted to the CIEE Study Center in Siem Reap, Cambodia - Center for Khmer Studies, 2007 Summer. Yep! I'm excited! I just got it in an email today! The seven-week summer program in Siem Reap, Cambodia is designed for students to learn the history of Cambodia-from the ancient times to 1970s-and come to understand it as a case study for geopolitical issues such as nation-building, radicalism, corruption, democracy, and economic development. The goal of the program is for students to gain an understanding of Cambodia’s history and culture from ancient times to the present, with particular focus on the causes and effects of the genocide of 1975-1979. Students are encouraged to approach Cambodia as a case study for several of the world’s most pressing geopolitical problems, including nation-building in societies recently at war, confronting radicalism, combating official corruption, and promoting democracy and stable economic development in smaller, less-developed countries. I have found my new home!